The machines manufactured by VLN are designed for optimum and highly reliable performance by thorough testing before delivery. 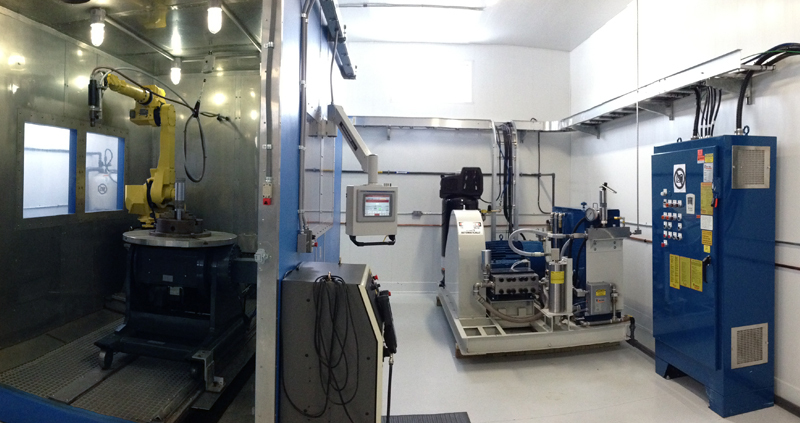 VLN introduces the first automated pulse water jet (PWJ) system on the market today. Our PWJ systems include automated robots for exacting precision and repeatability. The systems can be operated by one person and are built with safety being the priority. Other advantages are the environmentally friendly aspect of recycling the water and not having any additives or abrasives needed in the closed loop system. Operation and maintenance costs are decreased while productivity and up-time are increased resulting from a lower operating pressure and greater efficiency than traditional high-pressure continuous systems. Our PWJ systems can be used to strip hard coatings, surface prep materials, peen parts or clean and deburr during manufacturing. Call us today to design and develop the system that’s right for your needs and become part of the clean, green manufacturing movement!